Harvey Cushing in 1932 described a fatal syndrome in humans characterised by unusual disposition of fat depots, osteoporosis, immune suppression, generalised weakness which was associated with basophilic adenoma of the pituitary gland. This syndrome we now know to be due to elevated concentrations of circulating cortisol of adrenal origin and hyperadrenocorticism has become known as Cushing's disease. 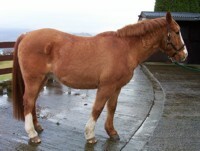 In the horse Cushing's disease is always secondary to a pituitary adenoma or hyperplasia; pituitary dependent Cushing's disease. ECD usually manifests itself from late summer throughout winter. This may result in laminitis during this period. This is the time of year when the day length is shortening. It is my view that ECD is due to a dysfunction in the pineal gland, the ancient "third eye" responsible for the recognition of light and dark periods. The pineal gland influences the pituitary gland via the hypothalamus. In horses there may be insufficient dopamine being released from the hypothalamus. Dopamine inhibits the pars intermedia of the pituitary gland. Therefore when there is less dopamine there is less inhibition of the pars intermedia which then increases in size. However there is a close interaction between melatonin, serotonin and dopamine and the balance of these three hormones/signalling molecules may be important in the pathogenesis of ECD. Affected animals tend to sweat more than normal, they lose weight despite an increased appetite. They may become diabetic, either diabetes mellitus, (sugar diabetes) or diabetes insipidus. They therefore drink excessively, and if stabled you will notice their bedding is quickly soaked. They show filling above the eyes. This is fat deposition in the supra-orbital fossae. 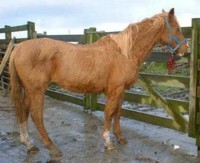 [Normal horses have depressions above the eyes, you can see these depressions moving when a horse chews]. Their body shape changes so that they lose muscle mass, developing a dipped back, poorly muscled neck and quarters with a pendulous abdomen. There is a re-distribution of fat depots. 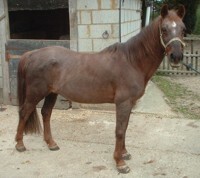 The horse looking thin ("ribby") but gaining a rather "blocky" appearance. 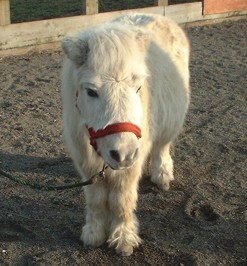 This is particularly evident if it has been dieted in the mistaken belief that it's laminitis is due to obesity. They may become immunosuppressed and subject to a variety of parasitic or infectious agents such as helminthiasis, sinusitis or pneumonia. With the plethora of tests used to confirm hypercorticism, which ones are safe for the laminitic and give most information relating to both Cushing's disease and Metabolic Syndrome? 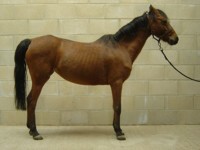 Whilst the dexamethasone suppression test or the combined ACTH stimulation / dexamethasone suppression tests are regarded as providing a definitive diagnosis of hyperadrenocorticism, I have known horses either develop laminitis, or suffer a deterioration in a pre-existing laminitis, following their use. Neither test provides any diagnostic information about hypercorticism not of adrenal origin; Metabolic Syndrome. Whilst a Thyroid Releasing Hormone response test is safe, it is only of value if the horse shows a baseline cortisol concentration within the normal range. Additionally, this test provides too many equivocal results to be reliable as a ECD test and again is non diagnostic for Metabolic Syndrome. A combined dexamethasone suppression / TRH response test has the disadvantages noted for both tests above. The test I use these days is a measurement of endogenous ACTH, cortisol, insulin and glucose. The test is safe for the laminitic, involves one blood sample and is relatively inexpensive. The test should ideally be performed first thing in the morning after the horse has been stabled overnight with no food provided. It is inadvisable to use any of the above tests if the horse is currently suffering from laminitis, the stress of which is likely to cause erroneous results. The presence of plasma endogenous ACTH concentrations greater than 70 pg/ml, elevated serum cortisol, insulin and glucose concentrations is diagnostic of ECD. Cases with normal endogenous ACTH concentrations (< 40 pg/ml) but with elevated serum insulin, cortisol and glucose concentrations are diagnostic of of insulin resistance and Metabolic Syndrome. 2. those which inhibit the production of cortisol e.g. trilostane and aminoglutethimide. 4. Light therapy. The use of artificial light of the correct wavelength and luminesence to increase the day length. The drug is expensive so if you use it make sure the horse eats it ! The surest way is to feed it from the hand either in a titbit or a sandwich. Potential adverse reactions in horses include inappetance, transient anorexia and lethargy, mild central nervous system signs (e.g. mild depression and mild ataxia), diarrhoea and colic! Dosage 2 microgrammes per kg bodyweight daily as a continuing treatment. This drug is much more expensive than Periactin but seems a little more reliable in achieving a positive response. This is the hormone normally secreted by the pineal gland and may help some cases of ECD by modulating the transmitters serotonin and dopamine. The suggested dose is 1mg/day given in the evening. Small white tablets (4mg Cyproheptadine) Effective in about 80% of cases. The dose rate is (0.6 mg/kg BW/day)3/4 increasing over 8 weeks. As this is complicated due to being based on body surface area I have provided some illustrations in the three tables below. 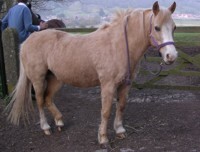 for a 300 kg Pony. for a 500 kg Horse. The recommended dose of trilostane is 1 mg/kg daily in the afternoon or evening. It does seem to help some horses with ECD but my own feeling is that reducing the circulating cortisol concentration, or the local production and action of cortisol is not getting to the root of the problem. Nevertheless some horses respond well to it, at least in the short term. To view an abstract of Dr McGowan's work on trilostane click here. This drug is pretty pricey! The recommended dose rate is up to 4mg/kg daily given as a single dose. My reservations concerning cortisol blockers apply to aminoglutethimide as they do to trilostane.